During the past nine years, Full House has racked up some serious praise for its Park City location. On the heels of those accolades, owner Huiying Deng opened a second location in Salt Lake in 2018. 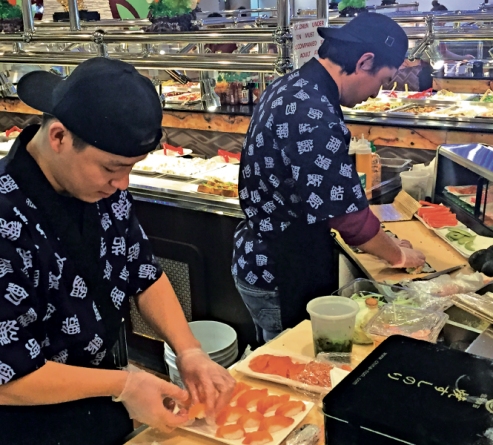 Full House specializes in sushi and higher-end American Chinese dishes—their plates arrive like frilled peacocks showing off their colorful plumage. The Slippery Shrimp ($19) is one of the house specialties, and it’s a great pick for seafood fans. It’s made of lightly fried shrimp which has been stir fried and topped with a spicy sweet and sour sauce. It’s a fine example of the elevated takes on traditional American Chinese that the restaurant is known for. La Cai has been serving up a mixture of Vietnamese noodle dishes—think pho and bun—and traditional Chinese stir-fried entrées for 22 years. Chef Hiep Vuu has made their house stir-fried beef ($15.95) the MVP of the latter side of the menu. It’s 14 ounces of marinated steak, sliced into cubes and seared in a wok with garlic and black pepper. The crispy, garlicky reduction that is left after this process gets poured over the steak cubes and veggies, then served with steamed rice. It’s the kind of dish that celebrates the flavor of a nicely cooked steak and uses a subtle spice palate to enhance that flavor. Five years ago, chefs Wei Zhong Zhou and Wei Qiang Zhou set out to establish a tea and dim sum house that reflected their respect for the Chinese dim sum tradition. It’s hard to go wrong with anything from the steamed section of the menu—their steamed BBQ pork buns ($2.80) are fluffy clouds filled with sweet and savory barbecued pork, and their shu mai pork dumplings ($3.20) are packed with silky smooth notes of flavor and texture. On the sweeter side of things, I can’t stress the egg custard buns ($2.80) enough. It’s a bit like eating a cream-filled doughnut’s more sophisticated cousin—the sweetness is second to the marshmallow-y texture of the steamed dough and custard. Boasting a nearly 20-year run, Little World is one of the crown jewels of State Street’s Chinese food offerings. Its lunch specials are gigantic and well-priced, and there are hundreds of options on its expansive menu that are just accessible enough to tempt foodie novitiates into trying something completely new. The squid with black bean sauce ($10.99) is a fantastic walk on the wild side. The crosshatched squid arrives looking like delicate flower petals, and the sweetness of the squid contrasts sharply with the black bean sauce in new and interesting ways. That, and their potstickers ($6.26) are among the best in the city. 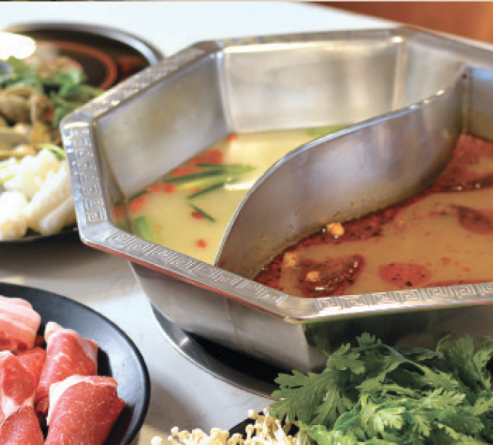 Despite Utahns’ fondness for fondue, the Chinese tradition of hot pots hasn’t established a strong foothold here as of yet. Hongtao Jia, owner of Kungfu Hotpot, is setting out to change all that. The restaurant opened in August 2018 and has been racking up rave reviews from local food writers and Yelp reviewers alike. Hot pot cuisine starts with a silver crock of broth that is kept boiling hot to cook noodles, veggies and sliced pork belly. It’s served buffet-style with two pricing options. $16.99 gets you the basic package, and $19.99 will unlock more options for your perusal. While the process sounds intimidating, the friendly staff and digital menus make the experience memorable regardless of your experience level. One of the State Street Chinese places in operation the longest—it’s been up and running since the late ’70s—Ho Ho Gourmet has seen its ups and downs. Regardless, its longevity has made it one of State Street’s culinary landmarks, and owner Kai Hing Ng has helped the restaurant maintain its strong local following despite a few missteps along the way. Sticking to the chef’s suggestions is the best bet—I particularly like their General Tso’s chicken ($10.95). The sauce strikes the right balance between sweet and spicy, and it all pairs nicely with the fried chicken. While we might never know what really happened to the old Golden Dragon—my bet is that it was eaten by the gigantic jade sculpture in the restaurant’s foyer—New Golden Dragon has established itself as one of State Street’s most versatile Chinese restaurants. It’s a safe bet to come here for dim sum because it’s frequently rated among the best Utah has to offer, but I happen to like their cost-effective lunch combos. The Mongolian beef combo ($6.45) comes with a huge helping of beef and veggies, fried rice, egg roll and fried shrimp. 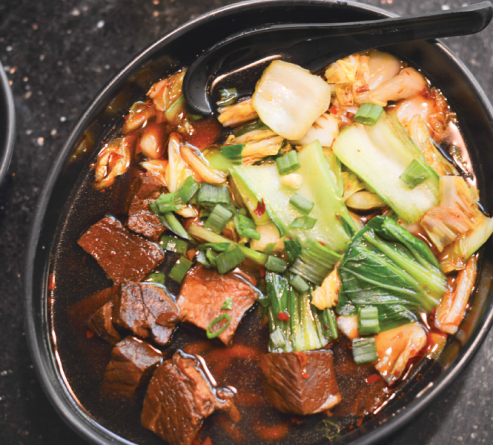 Owned and operated by Chef Xiao, who learned his craft in the restaurants of Hong Kong, New Golden Dragon is one of Salt Lake’s most consistently tasty Chinese restaurants. Despite the fact that China Town Eatery has played musical chairs with a few different restaurants in the Chinatown Supermarket space near 3300 South and State Street, it looks to have found its permanent home. Officially opened in 2011 by owner Chik Tim Yu, China Town Eatery offers both a dim sum and an entrée menu, both of which are full of Cantonese flavor. It’s one of the places where I like to get congee, a rice porridge that is made with chicken or the occasional preserved egg for the stouthearted. Chicken congee ($3.50) doesn’t look like it will fill you up and keep you warm for a good three hours after ingestion, but this stuff is ideal post-hangover breakfast food. Whether it’s intentional or otherwise, One More Noodle House has set itself up as a hot shot upstart in a neighborhood of noodle house veterans. Based on my few visits, however, those old shops would be wise not to underestimate this unassuming noodle joint. Owner Jason Liu opened the restaurant just over a year ago, and they specialize in regional noodle soups from all over China. The numbing spicy beef noodle ($8.98) makes good use of a broth heavy on Sichuan peppercorns that numb the tongue as a predecessor to the smoky heat to come. All their noodles are house-made, making their toothsome texture the perfect counterpart to broth that is full of subtle flavors. Speaking of noodle house veterans, in the four years since Wayne Ye opened CY Noodle, it’s established itself as a place for noodle connoisseurs from all over the state. While they rebranded to include more Chinese dishes to the menu, I’ll always love their fast-casual approach to the traditional noodle house menu. Diners get the option to choose the noodles, broth and protein for their noodle bowls ($9.25), and it’s worked wonders for me. My current favorite is the soup with udon noodles and spicy beef with a bit of bok choy and napa cabbage. Both the traditional and tomato broth are delicious, but the Sichuan spicy broth is great for those looking for a bit of heat. Billing itself as Utah’s first authentic Chinese barbecue, Chinese Taste shares the joys of cooking skewers of lamb, beef and pork over an open flame. Said skewers are reasonably priced, ranging from 99 cents for skewered veggies to $6.99 for seafood like scallops. 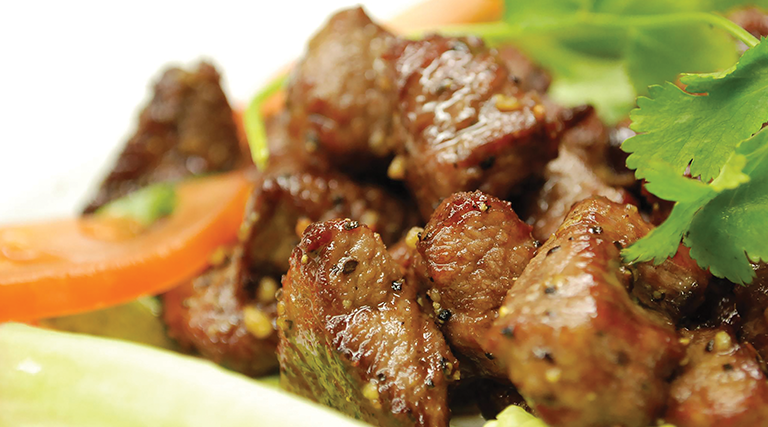 The lamb and beef skewers come with a smoky dry rub, and the spiciness can be made to order. Adventurous eaters can try unconventional fare such as pork kidneys and chicken hearts. Chinese Taste also offers a few hot pots if you’re visiting with a group—the spicy incense pot ($16.99) is a good place to start. If you’re looking for a Chinese buffet with all the pomp and circumstance of a Las Vegas casino, then look no further than King Buffet. With three locations—one in Taylorsville, one in Orem and its newest addition on State Street—King Buffet has always got its eye on expanding. Pricing is always a flat rate—$8.95 for lunch and $12.95 for dinner. For that meager entrance fee, diners are treated to a buffet that contains hundreds of different options, including sushi. It’s easy to get overwhelmed by a menu of this size, so I suggest heading in with a game plan. I’m a fan of seafood, so that’s always where I start. Their salt and pepper shrimp is awesome, and their sushi game isn’t too bad either. It really is a no-holds-barred look at Chinese cuisine, so the only real rule is to come hungry.